This post was composed at the end of July 2015. I have waited until now to publish it. For those who aren’t aware of what a gag order is, I’d like to do a quick informational session. Gag orders can also be called protective orders. They are typically used to prevent parties in a trial from discussing anything pertaining to the trial with the public. It is supposed to protect potential witnesses, jury members, and other people. Usually gag orders are used in criminal trials in order to assure the defendant receives a fair trial. People can only shelter themselves from the media so much and with some highly publicized cases it could be next to impossible to find jury members that have not been swayed by an article they’ve seen on the Internet or something they’ve seen reported on the news. There are different types of gag orders and they can cover different things but, usually, anything that was discussed before the gag order took affect is fair game. For instance, say there is a trial for a famous murder suspect. This would be a highly publicized case. National, if not international, attention would most likely be attracted to it. If the suspect in the case had discussed A, B. and C with the media before a judge instituted a gag order for trial participants, then A, B, and C can still be discussed and reported on in the media. Gag orders used to be applied to journalists but that was found to be unconstitutional and directly violated freedom of the press. To bypass this, judges just began silencing the participants. Gag orders are very controversial and some have been challenged with success in the court room. I have not been able to come up with any cases of gag orders being applied for circumstances such as Kimberly’s except for the case of Carri Stearns, whose story is similar to Kimberly’s. Personally, I believe gag orders for cases where there is no jury trial are just another way to shut people up. Unfortunately, cases like these need to be publicized so people are aware. 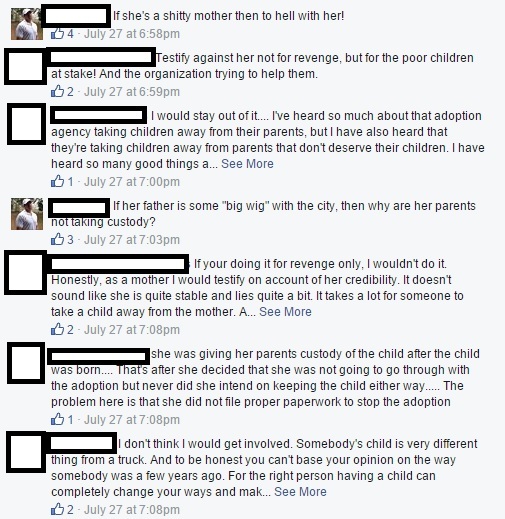 Going through comments after comments on article after article I would estimate 90% of the public has no idea how adoption or adoption laws even work. It’s sad. Since gag orders have no authority to stop reporters from reporting on cases, the media and journalists are free to report on it and find other sources to gain information. I have been working on this for a little while so that I can try to give some sort of update to all of Kimberly’s supporters. No one is as frustrated as you all that we are not being informed with what is going on. To do this, I took to social media. Scouring through comment after comment on all the news articles that were posted on Facebook as well as individual websites I stumbled across something. Remember, gag orders apply to ALL parties in a case. So, since Kimberly isn’t allowed to talk about the case, neither is Kate Sharp or her associates. I found a comment on one of the articles from a [name hidden to protect the identity – we’ll call him C]. C commented about a car accident that Kimberly had caused 4 or 5 years ago that involved rear-ending him. 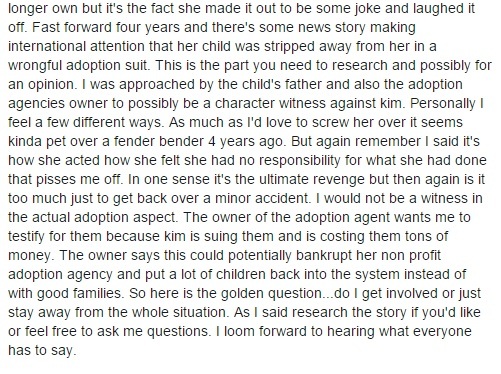 C was upset because nothing ever came of it and made some allegations that maybe the police were involved in helping Kimberly lie, or something like that, and that Kimberly had given the police a false name and ID when they arrived at the scene of the fender bender. He never recouped costs. If I were in C’s shoes I would probably be a little perturbed about that as well. Kimberly is not at liberty to discuss the case, but she is at liberty to tell me anything else she wants unrelated. So I asked her. We had previously talked, before the gag order, and I had asked her to tell me all the dirty little secrets. Sadly, when you case becomes publicized, everyone will pick you apart and find reasons why you shouldn’t have your baby. It is quite amusing, however, because it is a very rare person, indeed, to not have any “skeletons” in their closet. I digress. Kimberly gave a general breakdown of the things she had done in her past. She didn’t disclose this accident but had disclosed a charge for underage drinking. I’m sure you’ve seen her mug shots when you google her name. This was her past, however. She was young, even a teenager for some things, and this was not who she was today. I must point something out. Kimberly works at a day care center. Federal law does not allow people with certain criminal records to work with children. You are also required to take a drug test and pass a background check to do so. Let me repeat, Kimberly works at a day care center. Where were we? Oh yes, I asked Kimberly about C’s claim in the comments section of the Fox10 Facebook posting. She said, flat out, “He has a right to be mad. I’d be mad. What I did was wrong and I never repaid him. But that’s not who I am now, that’s who I was then. That was like 5 years ago.” She’s right. 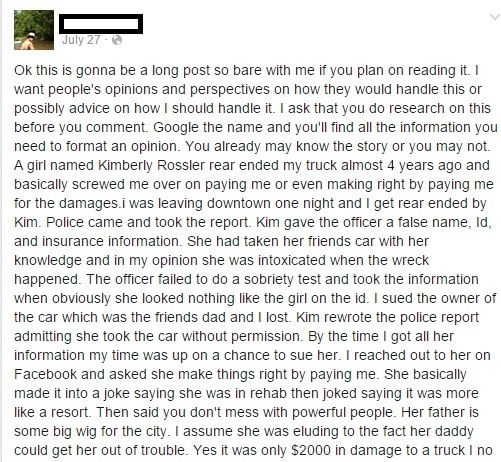 I decided to visit C’s personal Facebook page and saw a public posting he had made in regards to Kimberly. He claims he has a decision to make and asks his friends to help. He goes on to tell about his run in with Kimberly those years ago and says he has been approached to be a character witness for the opposition in this case. He tells his friends what she had done to him and asks if he should do it. You know, since she wronged him in the past. He does not know Kimberly personally, and admits to this in the comments. His only knowledge of her is based on this one incident, almost 5 years ago. The comments that followed were a mixed bag. Some said don’t’ get involved, others said to go for it and use it as a means to “get your revenge.” C commented here and there, made some jokes. It really was quite the show. This leads me to believe that C has been approached by David Broome, legal counsel for Kate Sharp, and has been asked to be a character witness because he has “dirt” on Kimberly. I’m no lawyer, but I’m also wondering if David Broome may have broken the gag order by discussing this with C. Maybe he did, maybe he didn’t. This also tells me something else. They are grasping for straws. This tells me they can find nobody that actually knows Kimberly that will attest to her character in a negative light. They are desperate and are seeking out someone who has no relationship with her, never has had a relationship with her, to testify to her character based on one wrong thing she did to him. Top that off with his possible “revenge” testimony and he isn’t very credible. From this one Facebook post I can go out on a limb and gain some pretty good information. Of course, none of it is 100%. He could be some whacko who wants attention. I’m going to choose to believe that this is not the case. Here’s another good thing. If they are seeking character witnesses that means that Kimberly’s rights were NOT terminated at that court date on the 24th. I scrolled some more through C’s profile. Most, if not all, of it is public. I took the proper screen shots in case they were needed to show the character of the “character witness.” His post mentions how he detests people who drink alcohol and then eludes to the loss of his father in some kind of accident. I’m wondering if his father wasn’t killed by a drunk driver which would also fuel his need to get revenge on Kimberly because of the incident between them almost 5 years ago. Punish those who are like the person who killed his father? I don’t know. This is all pure speculation. There you have it. The best update that I could come up with. I hope it’s enough for now. I know it’s definitely better than nothing and it does seem hopeful. Thank you all for your support and patience!! Interesting. You really are passionate about justice. Wish there were more people like you out there.